GRACE organized a multistakeholder at the annual conference of the „International Society for Miscanthus and perennial Energy Grasses (MEG) e.V.“ in Bonn. GRACE organized a multi-stakeholder workshop at the annual conference of the „International Society for Miscanthus and perennial Energy Grasses (MEG) e.V.“ in Bonn/Germany, where Moritz Wagner and Andreas Kiesel discussed value-chain organization and sustainability issues relating to miscanthus biomass utilization with farmers, biomass users and industry representatives. 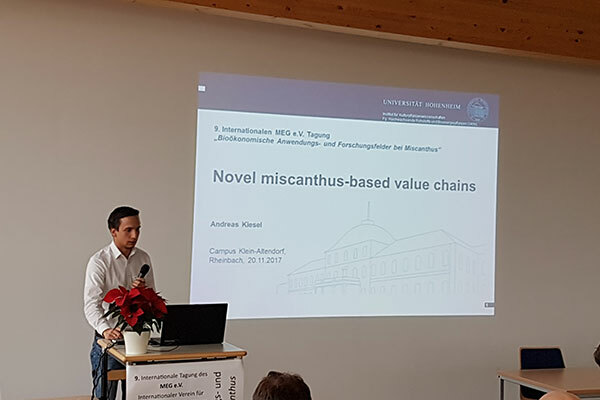 Andreas Kiesel also gave a plenary presentation about the GRACE project and other areas of miscanthus research currently being performed at the University of Hohenheim.